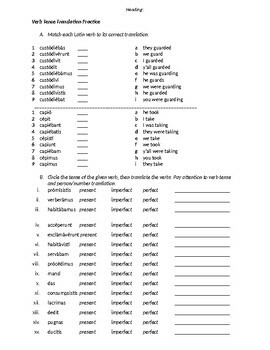 In part A of this two part assignment, students are asked to match Latin verbs to their definitions. 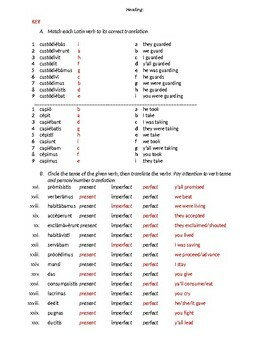 In part B, Latin verbs are provided in present, imperfect, and perfect tenses, and students are asked to identify their tense and translate using the appropriate pronouns and tense. This activity uses vocabulary from Unit 1 Cambridge Latin Course, but is pretty standard vocabulary for all level 1 Latin courses.